UP Election Results 2017: BJP President Amit Shah credited the win to PM Modi's leadership. BJP chief Amit Shah, delivering his victory speech at the party's headquarters in Delhi, where he was welcomed by hundreds of workers singing and dancing to celebrate the party's massive sweep of Uttar Pradesh, said Saturday's election results prove that Prime Minister Narendra Modi is the most popular leader since Independence. 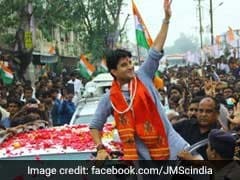 "The results are very encouraging for the BJP, we are going to form government in four states - UP, Uttarakhand, Goa and Manipur," the BJP chief said, thanking voters and party workers in all five states where assembly elections were held. He said the results were a victory of Prime Minister Narendra Modi's leadership and the mandate would "take the country's politics in a new direction." The BJP, along with allies, has won 325 of UP's 403 seats, leaving less than a 100 to be shared by all other parties. It has also swept Uttarakhand, adjacent to UP. Goa and Manipur, which saw direct contests between the Congress and BJP, have not given any party a majority and the BJP is in with a chance to form government with the support of others. 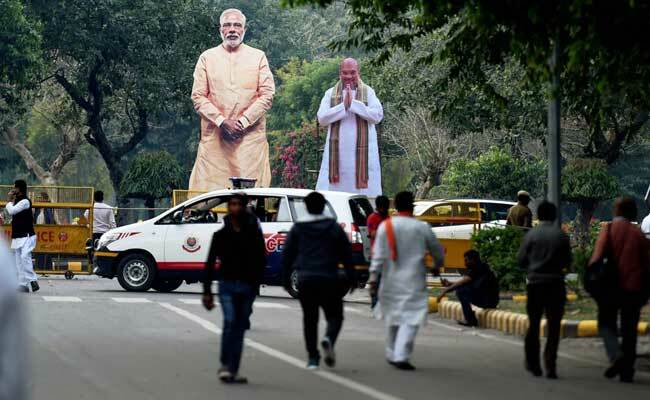 UP election results 2017: Giant cutouts of Amit Shah and PM Modi outside party office in Delhi. 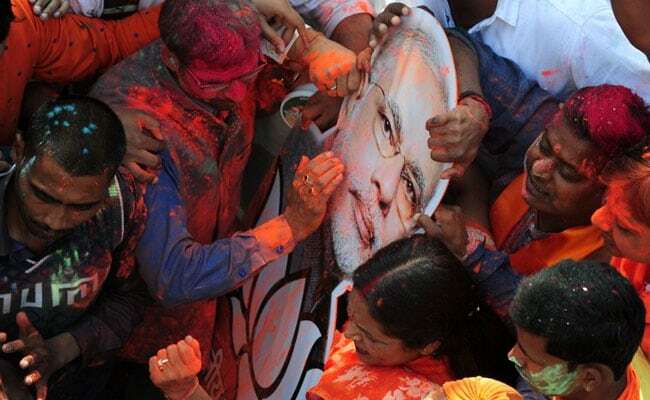 As results rolled in on Saturday morning, union minister Ravi Shankar Prasad said the Modi wave was "becoming a Tsunami." He also said, "And as party chief, a lot of credit goes to Amit Shah, who worked tirelessly." PM Modi was the face of the BJP's campaign in Uttar Pradesh, with the party doubling his rallies in the middle of the polls over worries that it may have had a weak start in the earlier rounds of the seven-phase election. In a final strategic push before the last two rounds of voting in eastern UP Amit Shah camped for over a week in Varanasi, PM Modi's parliamentary constituency, deploying almost two dozen union ministers in an intense campaign. PM Modi was in Varanasi for three days holding road shows and rallies in the longest campaign by a Prime Minister in his constituency. The Prime Minister turned the UP contest into a test of his personal popularity and his radical notes ban to eliminate corruption and black money. The win is seen as a ringing endorsement of his high-risk decision last November to scrap 500 and 1000 rupee notes worth 86 percent of the cash in circulation. Investors counting on further economic reforms - including the launch of the Goods and Services Tax - will welcome a strong BJP win and see its consolidation of power as a boost for economic growth. The UP election was billed as a semi-final before the 2019 national election, when PM Modi will seek a second term. Today's win will also help improve the BJP's strength in the Rajya Sabha or upper house of parliament - whose members are elected by state legislatures. The government is in a minority in the house and has trouble pushing key bills.